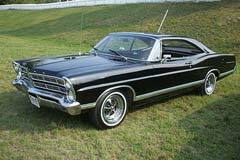 The Ford Galaxie was made from 1959 to 1974 and was a full-size automobile. The 1959 Fairlane and Galaxie were basically the same but had different ornamentation. The unique Galaxie convertible had an all-steel hardtop that could be put into the trunk at the push of a button so the car could become a convertible. In 1960, the car's body changed to the Starliner style and five engine choices that were available. In 1961, the body style also changed, it had a bulleted grill, along with a rear panel design and many different trims were offered. The body style was wider in 1965 and by 1967, nineteen Galaxie models were available. All of Ford's engine types and transmission types were offered. In 1968, it was redesigned and had concealed dual headlamps. More powerful engines were available as well. The 1969-1972 models were bigger, longer and wider. Ford offered seven different engine choices. These models had all of the automatic options that Ford made. The 1973 and 1974 models were shorter and were available with a V8-engine, along with the select-shift transmission. In 1975, Ford decided to combine most of their full-size automobiles under the LTD name. The Galaxie production line includes the Galaxie, Galaxie 500 LTD, Galaxie 500XL, Galaxie 500 and the XL. 1962 Galaxie 500 XL HIGH-QUALITY BUILD, 390 V8 TO 406 SPEC, PERIOD CORRECT LOOK, CLEAN 500XL, FAST! 1962 Galaxie Sunliner 1 woman owner since new! Frame off restored.